Like most every game made by the development house Treasure, Gunstar Heroes is an absolutely relentless action game. The action only lets up for a surprising (and completely unnecessary) amount of plot in-between levels. I've always been a fan of the Bad Dudes approach to action game storylines. "Ninjas have kidnapped the President. Are you bad enough?!" Do action games really need much plot? Ahh..... I remember the days of Contra, where you didn't even know the game had a plot unless you beat it. Gunstar Heroes has a number of characters both good and bad that reappear throughout the game. Maybe I'm not geeky enough, but I just don't want to get into the plot. Gunstar Heroes is not about plot! It's about killing people, blowing things up, and the very Japanese weirdness that is the calling card of all Treasure games. The play control has a lot of the features you would expect from a game of this type, but also a lot of surprises. Before you begin your game you are given the choice of "free shot" or "fixed shot". The free shot option allows you to run and fire at the same time and is often preferable in open level situations. With the fixed shot option you cannot run while firing, but the ability to stand still and fire in any direction is a huge help when fighting bosses. I personally can't imagine anyone playing this game for long and still choosing the free shot option every game. Another neat addition to Gunstar Heroes is hand to hand combat. You can throw enemies, and slide into them by pressing down and jump. There is also a super slide that can be executed by rotating the control pad like you would to throw a fireball if you were playing as Ryu or Ken in Street Fighter II. Enemies can also be kicked in mid air by pressing the jump button again. This can cause a lot of damage, and can be extremely helpful against some bosses. If you are playing with two players either player can throw their partner at enemies which causes massive damage. Some bosses can be defeated in three or four hits this way. Note: For those of you that are curious, the FAQ's included on this site get a little more into the characters and game plot. The programmers of Gunstar Heroes went way out of their way and included dozens of graphical effects that had never been seen on the Genesis. Bosses rotate, backgrounds warp and shift, and the intro includes a polygonal Treasure Logo. No other game on the Genesis pushed the system this far. In fact, nothing on the Super Nintendo scaled objects as well, or moved this fast or smoothly with the possible exception of a few Super FX chip games. Gunstar Heroes draws a lot of comparisons to Neo Geo games like Metal Slug. Although the Genesis hardware is obviously inferior to the Neo Geo, you wouldn't know it by playing Gunstar Heroes. Much like Metal Slug the bosses in Gunstar Heroes are made up of tons of sprites that move and jiggle independently. As a result the bosses animate better than anything else you've seen on the system. I don't know how they do it, but Treasure seems to find a way to get the most out of any system they program for. The graphics in Gunstar Heroes are among the best ever to appear on a 16-bit system. Perhaps I've seen sprites that were more expertly drawn, but I've never seen a Genesis game that moves like Gunstar Heroes. Sometimes I've felt that some Treasure games have lacked a bit in art direction, but from a technical standpoint they are almost always groundbreaking. 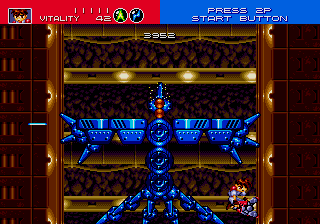 One of the most inventive aspects of Gunstar Heroes is the weapons system. There are four different type of weapons: fire, lightning, homing, and machine gun. Much like other games in the genre (Contra / Metal Slug) the weapon you are using plays a large role in your success. What makes Gunstar Heroes different from other games is that you have two weapon icons at the top of your screen. Every weapon on it's own behaves as you would expect, but is quite weak. The fire weapon is a flame thrower that causes a lot of damage, but has short range, the homing weapon follows enemies, the lightning or laser gun fires in a straight line, and the machine gun causes lots of damage. In Gunstar Heroes you can mix and match the weapons. If you load yourself up with a fire and a homing gun you can select each individually, or you can use them together. The result will be a flame thrower that seeks the enemy. Mixing the machine gun and the fire will give you projectiles that explode in flames upon impact. If you combine two of the same weapon you end up with a more powerful weapon. The machine gun causes more damage, and the flame thrower has a much longer range. My personal favorites are the double flame thrower or the flame/machine gun combination. Everyone has their own preferences, and I would encourage anyone to find out what they enjoy the most for themselves. There are weapon combinations that may make some levels seem too easy. It may be best to choose a favorite combination that maintains the fun and challenge of the game instead of a combo that makes the level a breeze. The levels in Gunstar Heroes are surprisingly varied and nonlinear for the genre. There are a total of 7 levels and the first four can be played in any order, although it is advisable to play them from left to right because the difficulty increases and you are rewarded with more health each time you beat a level. The first of the original four levels is a standard run an shoot level. If you've played any number of games in the genre you will know what to expect here. The second level is a bit different. It takes place in mine shafts and the players can attach their mine carts to the ground or the ceiling. The mine shaft flies by at dizzying speeds and occasionally changes directions scrolling both vertically and horizontally. The third level is more of a standard shooter level with both vertical and horizontal scrolling. This level features some really nice special effects and really gives the player the feeling of speed and height. The last of the original four levels is really different. It is a series of challenges and battles laid out in board game format. The player rolls a set of dice and then advances to the next challenge. This level can vary greatly in challenge depending on which squares you land on. After the fourth level the game becomes linear, but the action only picks up. There are three levels left in the game at this point. The first is another side scrolling level that seems to go on forever, but don't worry, there is a secret way to get unlimited health (read an FAQ). Then comes the outer space shooting level that is quite unlike any other level in the game. 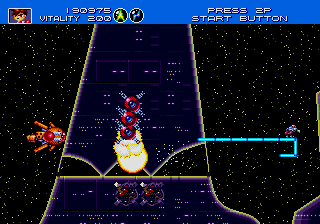 The level plays almost like a cross between Gradius and Smash TV. You can move and fire in any direction, but as long as you hold down the fire button, the angle that you are firing in stays fixed. If you are playing with two players the cannon and the ship are controlled separately. This is lots of fun, and one of the reasons that this is such a fun multiplayer game. The final level is made up of mostly boss battles. You need to fight every boss once more. This shouldn't be too much of a problem because by now you should have a pretty good handle on how do defeat each boss. But don't expect it to be a total breeze, the bosses will mix up their attacks a bit. After you've defeated all of your enemies one more time you will fight the game's final boss. If you have gotten this far, you should be well prepared. If you are playing with a friend, hurl your partner and make short work of him. Note: For a much more in-depth breakdown of the levels read one of the FAQ's in the Game Help section of this site, or visit my favorite game help site gamefaqs.com.